Busy family? High pressure job? Are you an athlete or a performer? Relax to Win! As you play, you’ll use breathing to control your stress levels. A proven tool for peak performance and stress reduction in a fun game format. Worldwide, clinical programs including Dual Drive have helped people improve their ability to concentrate and advance toward achieving life goals. These programs have also helped developing children, busy families, and people in demanding physical careers reduce stress. Just because Dual Drive has a positive purpose doesn't mean it's a snooze. Players are able to choose their own car, customize its color, and then choose from among many different missions. Dual Drive Pro responds to heart rate rhythms and finger sweat changes as measured by USB finger sensors. Heart rate and finger sweat changes are reliable measures of stress and relaxation. Dual Drive includes tracking and review features that let you view detailed graphs of your heart rate and relaxation levels. Progress reports and session review show your increasing abilities to relax. 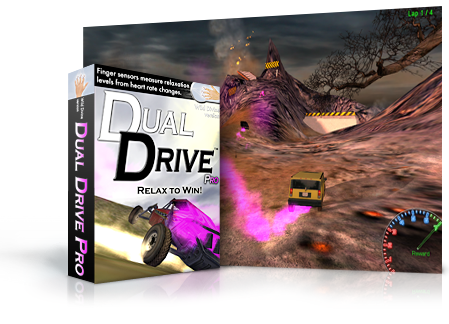 Relax to Win as you accelerate & control your car through incredible 3D graphical scenes. Dual Drive Pro teaches you relaxation and optimal breathing techniques. When you learn and practice these techniques in Dual Drive you can see your heart rate changes and relaxation (optimal HRV) levels. This gives you important feedback as to how well you are breathing and how relaxed you are. While playing Dual Drive Pro in racing mode, the breath pacer helps you breathe slowly and steadily while the relaxation dial shows how relaxed you are. Relax and breathe in and out with the breath pacer to raise the dial and power your car. Training with our own supplemental guides. This game requires the finger sensors from the Wild Divine.